The Cenotes of the Riviera Maya offer you the opportunity to enjoy this extraordinary work of nature without traveling too far from your comfortable hotel. 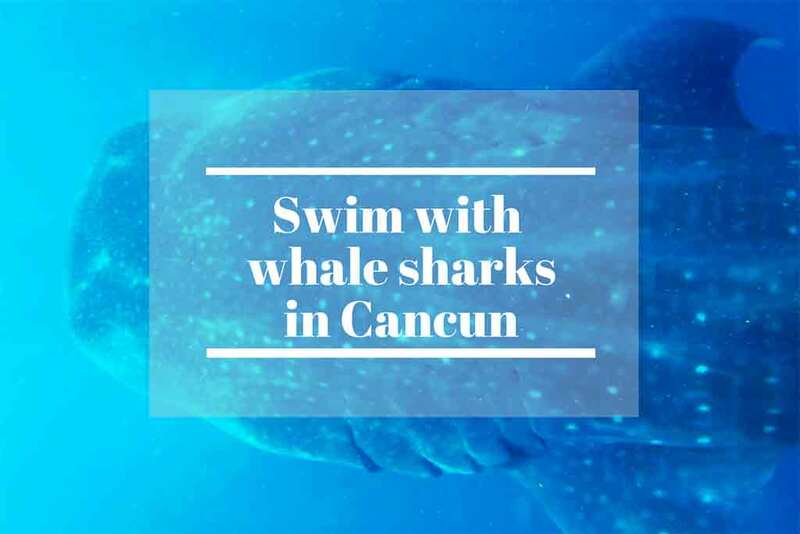 They are a lot and all scattered along the main road (Carretera federal- route 307) that connect Cancun – Puerto Morelos – Playa del Carmen and Tulum. 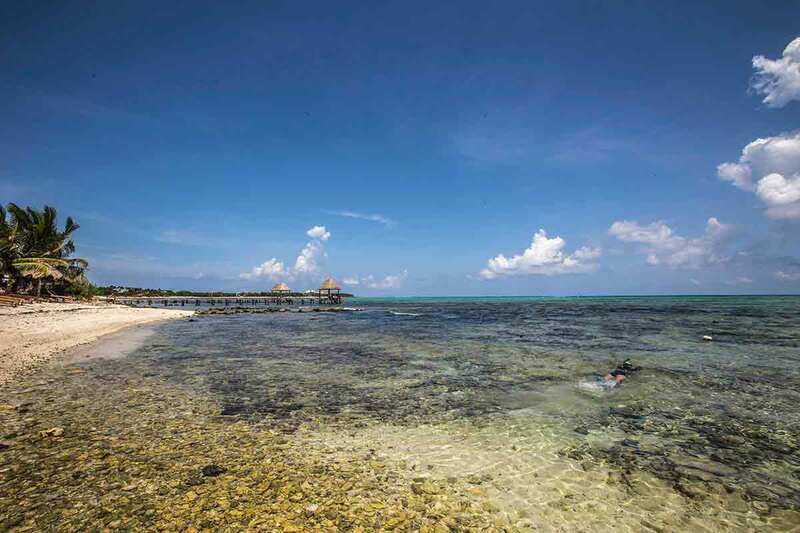 For precision of information, Cancun and anything before Puerto Morelos are not included in what is called the Riviera Maya, a term that indicates instead that stretch of coast that goes from Puerto Morelos to Tulum. 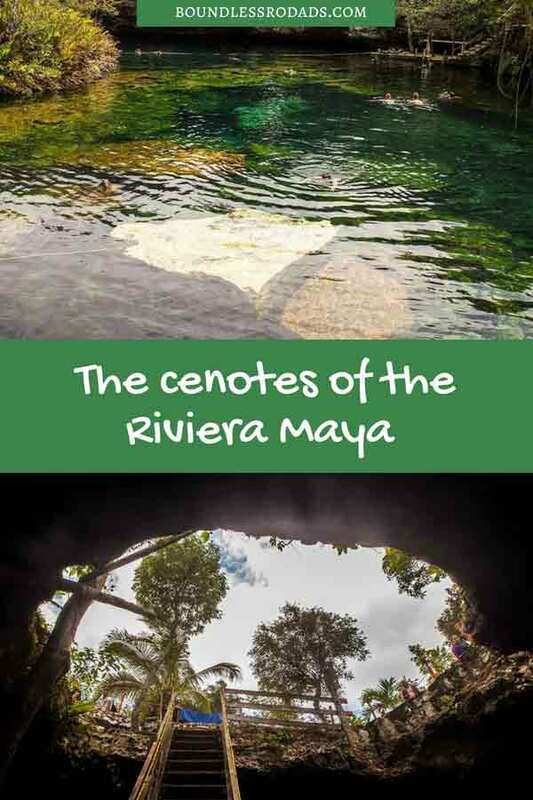 I have already mentioned the beautiful cenotes of Puerto Morelos, on the Ruta de Los cenotes in this, hopefully comprehensive, article. 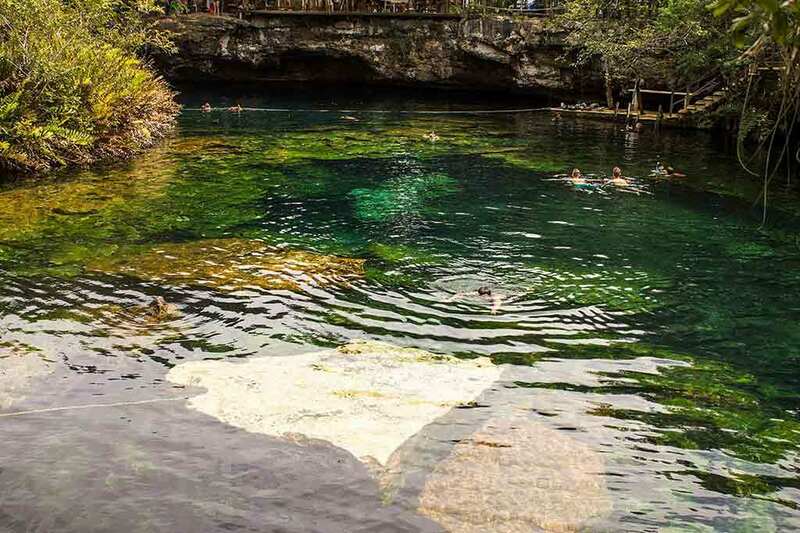 Although the Ruta de Los Cenotes deserved to be covered by itself and treated on a separate article, it can be considered as part of the cenotes of the Riviera Maya area for being located at a relatively closed distance from the Riviera Maya. Or at least I want to think so. Now I will be talking about the other cenotes that you will find right on the coast, or better said on the opposite side of the beach from the main road. 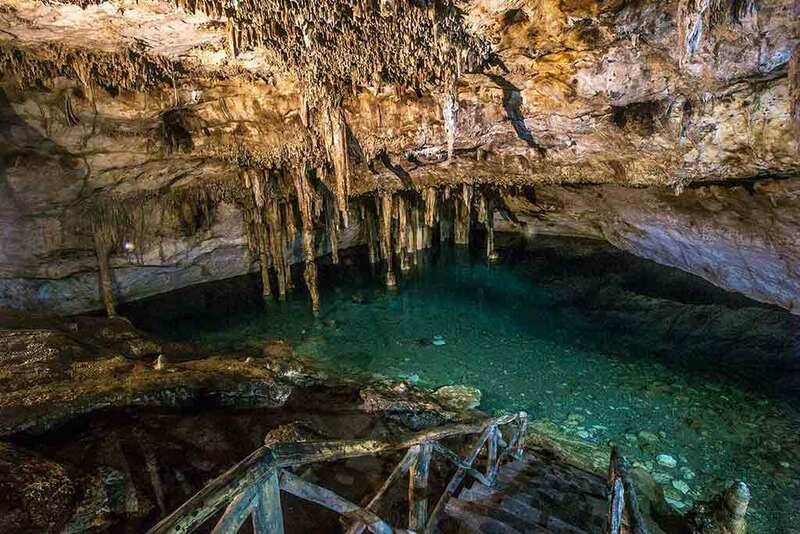 Just like in the other articles on the cenotes, also here I have asked for the help of my expert friend, excellent photographer and blogger Sandra and her beautiful blog El Camino màs corto for the missing pictures. Unfortunately, my hard drive left me before giving me the time to save the pictures somewhere else. My bad! Sandra’s photos have her name on them, while the few that I have recovered from my lost batches and have no credit reference. Here is a map with all the cenotes you will find on the Ruta de los cenote. You will see the map on a sign right at the beginning of the road in Puerto Morelos. Before moving forward, I need to spend a few words on what is a cenote. If you like you can find out more detailed information here. As a heritage of the Mayan culture, the cenotes of Yucatan are deep underwater lakes whose waters are filtered from the rocks either from underneath or from the rains above. 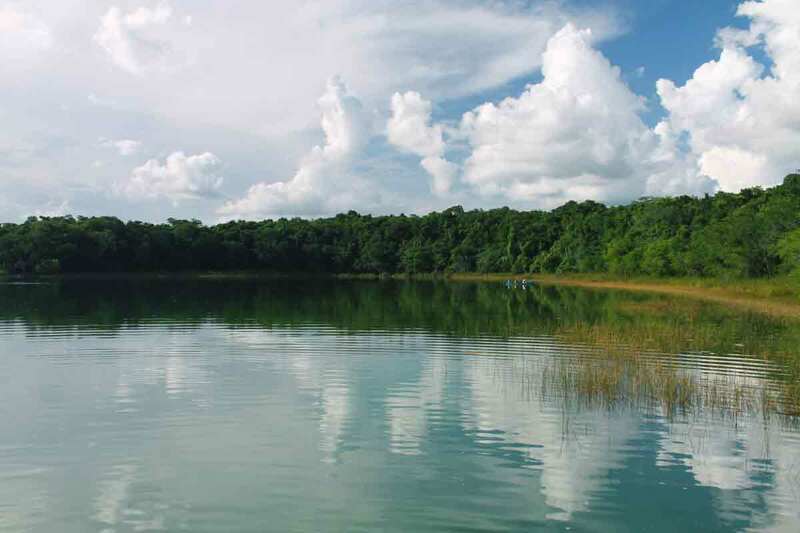 They are all scattered around the entire peninsula of Yucatan and they are one of its most precious natural treasure. The entire flat and low region is made of limestone bedrocks which allow the rainwater to filtrate the soil allowing huge deposits of water and underground rivers. The importance of the cenotes goes back to the Mayan times, the pre-Hispanic population that inhabits this area. They used the cenotes not only as precious and unique sources of water provision but also sacred places for their religious ceremonies. More about the history and geology in this post. Just like the popular towns of Homun and Cuzamà in Yucatan and La Ruta de Los cenotes in Puerto Morelos you can find many cenotes along the Carretera Federal (as you can see in the below map). The majority of the cenotes of the Riviera Maya are located on the side of the road that is opposite from the beach although there are a couple right by the beach, fascinating ones. I have visited some of them but I will tell you also what I haven’t personally seen but I have heard of, just for the sake of information. 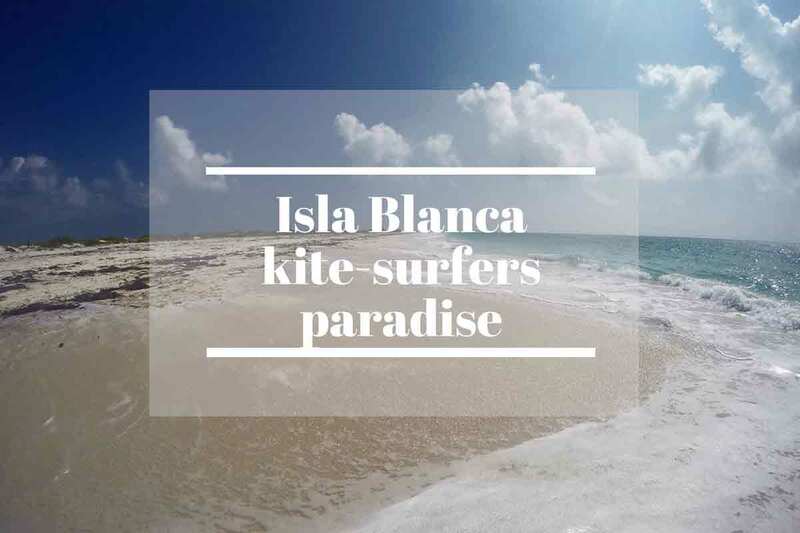 The list will follow a geographical order from Puerto Morelos to Tulum. 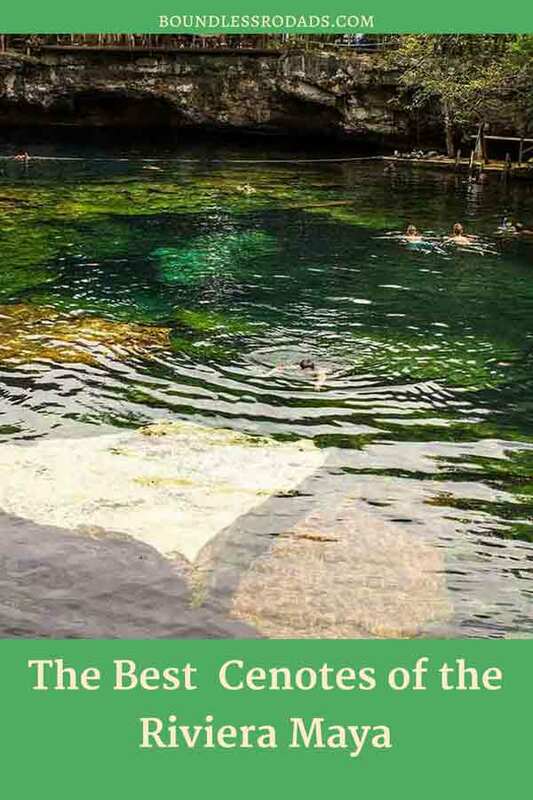 However, if you are interested specifically in the Tulum area, you will find this guide on the Cenote around Tulum more suitable for your needs. You can also check them out on the map at the end of the post. So if you are ready, let’s start. This is the first one you meet on the way from Playa del Carmen to Tulum. 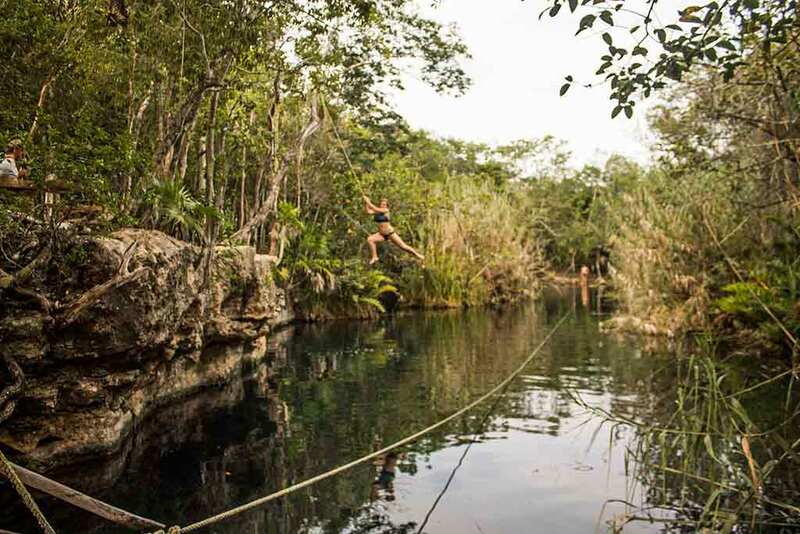 It’s an open cenote surrounded by rocks and vegetation and you also have a lovely natural platform from where to jump. It’s about 4mt high, about 12 ft. It’s a great photography setting. In fact, the day I was there they were doing a photo shooting for a wedding. This cenote, for being so close to the city and very accessible is often very crowded. In order to enjoy it fully, you should avoid weekends and prefer early hours. Cenote Eden (o Jardin del Eden) is one of my favorite in the area, although I normally I find cave cenotes more appealing, Cenote Eden is quite fascinating too. It’s a huge round body of water surrounded by a lush generous vegetation. You can see the beautifully shaped rocks emerging from the deep bottom through the emerald crystalline water. The only time I went I spent the whole day, lay on the huge platform watching people jumping and after a too long hesitation, I managed to jump too. So proud. But the platform was not that high. It was a weekday and the cenote was not that crowded. Just a few tourists and some divers. You can take your snorkeling gear with you, which might be handy. For sure you will have fun. 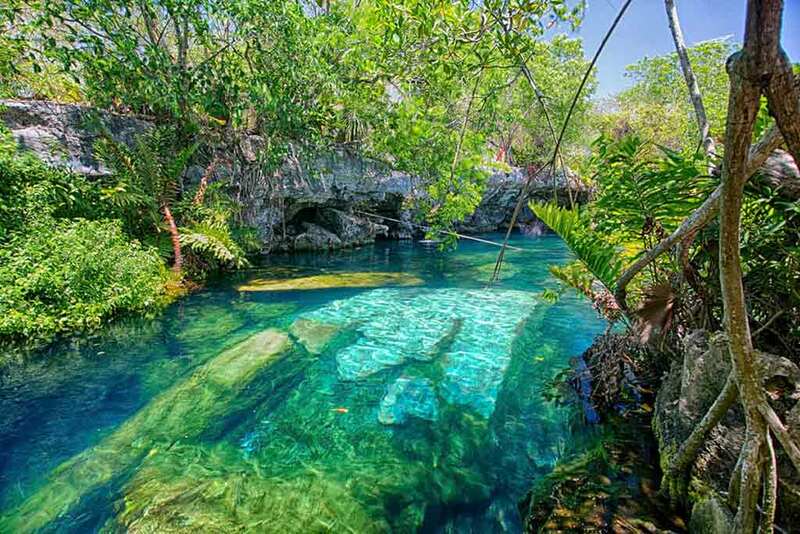 The cenotes Dos Ojos, which means 2 eyes, is one of the most popular among divers. It is a flooded cave system that has been explored since 1986 and it’s still in the radar of the passionate adventure divers and archaeologist. According to the information we have the underwater cave system is around 61km long with a depth of 396 feet (118 meters)and with that length it remains one of the top 10 underwater cave systems in the world. Diving in there is no joke. It requires a good level of preparation, apt equipment, and an expert guide. Of course, you don’t need to be a diver if you just want to enjoy the cenote, have a swim and even snorkel. If you dive though, you can enter from one cave and come out from the other, hence the name. 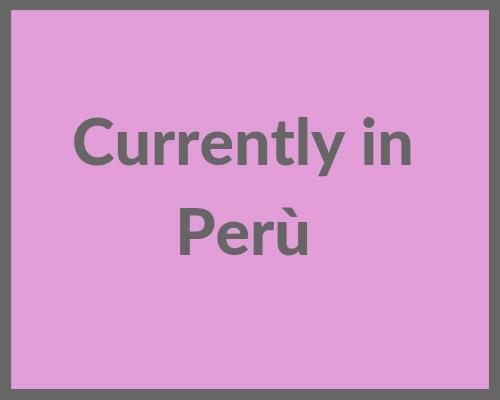 Opening hours 8-5 – Admission is 100 pesos(approximately 8 USD) for adults. If you dive you need to ask your diving shop. Entrance fee can be included or not. Always ask. This is a typical cave cenote, with underground tunnels and beautiful rock formations like stalactites and stalagmites. The tour last about 45 minutes and it is always led by a guide. Despite its undiscussed beauty, I find it super overpriced as the cost is 900 pesos (45$) and I don’t really believe it is worth it when if you go a little further in the Yucatan peninsula you would find the same breathtaking beauty, more untouched. The center offers other activities such as diving and zip line. The beauty of this place is not even dimmed by an overcast sky, like the one I have found. This cenote is more like sort of a lagoon, surrounded by mangroves, home of a huge amount of bird and fish spices. The emerald transparent water will have you jump in a second, as soon as you approach the rim. A snorkeling tour with a local guide is sincerely recommended. There is a lot of sea life to discover right there. To know more about it read this article. This was indeed a beautiful surprise. I was checking out the beaches, and I literally bumped into this beautiful emerald color body of water surrounded by lush mangroves. The cenote is also called Manatì for the presence of these funny marine mammals whom you can now rarely see as they have been unfortunately scared away by the human proximity. You can pay the entrance at the restaurant, opposite from the cenote, called Casa Cenote as well, where you can also find cheap and modest accommodation. The entrance is about 8$ (150pesos)and it includes the life jacket. The road that leads you there is an unpaved road towards the sea situated at about 9 km from Cancun. You will see a white big sign with a peacock painted on it saying Pavo Real Resort. When you actually meet the resort you make a left and a few meters ahead you are there. You won’t miss it. Keep your eyes open as this is also a beautiful road with lovely hotels and interesting beaches. In fact, right in front of the cenote on the beach side, there is a pebble beach with access to the sea ideal for snorkeling and diving. A nearby dive shop will rent you the equipment and will take you diving. I haven’t tried them so I cannot recommend them. 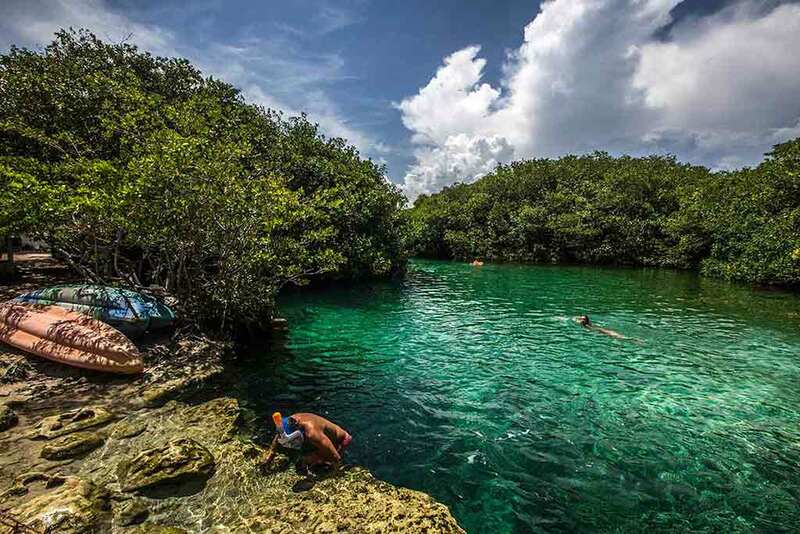 Xcacelito is a tiny fascinating cenote located right by the sea, right beside a beautiful beach called Xcacel. The beach is popular for their work on the preservation of the environment especially for looking after turtles nestling on the shore, protecting their eggs and releasing the new babies when it’s their time to come to life. I spoke more about it in this post. These two beautiful cenotes are located right past Tulum coming from Playa del Carmen, at less than one mile from the city center. If you are staying in Tulum you can easily reach them by bicycle. You pay the entrance at the cenote Cristal and it is good also to visit the cenote Escondido, located on the opposite side of the road. Cenote Cristal ( on the main picture) is a huge open cenote, surrounded by a thick and lush vegetation reflecting on the blue water that makes it even more beautiful. It’s 7 meters deep and you can both swim relaxedly or jump from a tall platform built for the courageous ones. There is also the possibility to dive. 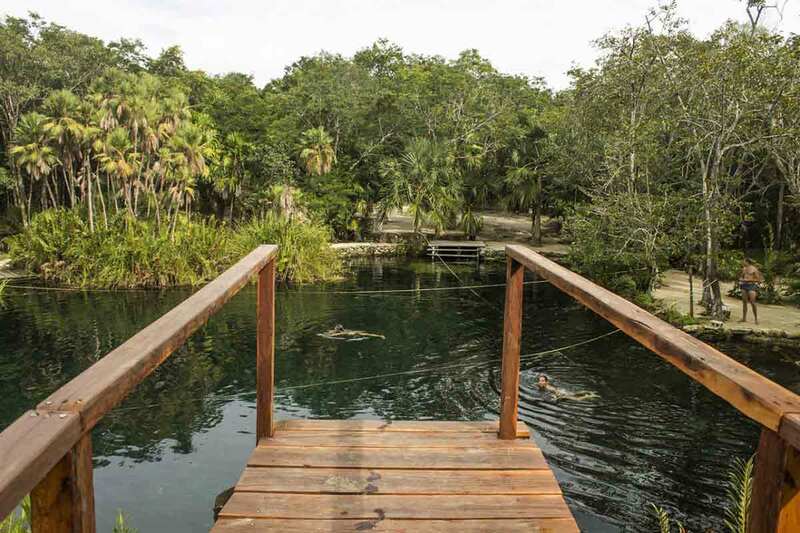 The entrance is 120 pesos (6usd) for both cenotes (200 for divers -10usd). Open from 8 to 5. By Car – Get on the main road (ruta 307) from Playa del Carmen to Tulum, you can see the signs on your right-hand side. Also, you can check the map here below where the cenote you are interested in is approximately located. By Bus You can catch the colectivo (minivans) in Playa del Carmen on Calle 2 Norte between Av. 10 and 15. Ask the driver to drop you off at the cenote you want to go. They will know for sure. The cost would be around 35 pesos. By Taxi A taxi to the cenotes from Playa del Carmen to Tulum, taken from Playa del Carmen should cost around 350 to 400 pesos(approximately 32-36 USD). The Grand Cenote is one of the most popular and, for a reason. It is, in fact, one of the most beautiful of the Riviera Maya, one of the reasons being the fact that half of it is open and the other is inside a cave. You can enjoy going through tunnels within the caves and coming out on the other side, just like the Cenote Dos Ojos, before mentioned. A downside of this cenote is that it’s always busy and it is rare that you can enjoy it fully by yourself like when you visit a less known one in the middle of the Yucatan peninsula. I know that living there and having the chance to explore more cenotes I have been a little spoiled. Maybe try to go very early morning when it opens, around 8 so that you might be able to be alone and really appreciate it more. Cenote Calavera is situated at about 10 km from the more popular and busier Grand Cenotes, on the way to Coba. I haven’t been here as it is especially known among the divers. The cenote is in fact very small apt for jumping and continuing the exploration underneath the surface. But there is not much space for swimming around and enjoy it. In the town of Coba, famous of the towering pyramid of the ancient Mayan city, there are three refreshing cenotes hidden in the beautiful green jungle definitely worth a visit, especially after a very hot day spent exploring the beautiful old Mayan buildings. They are at only 10 minutes drive from the Coba archeological site. 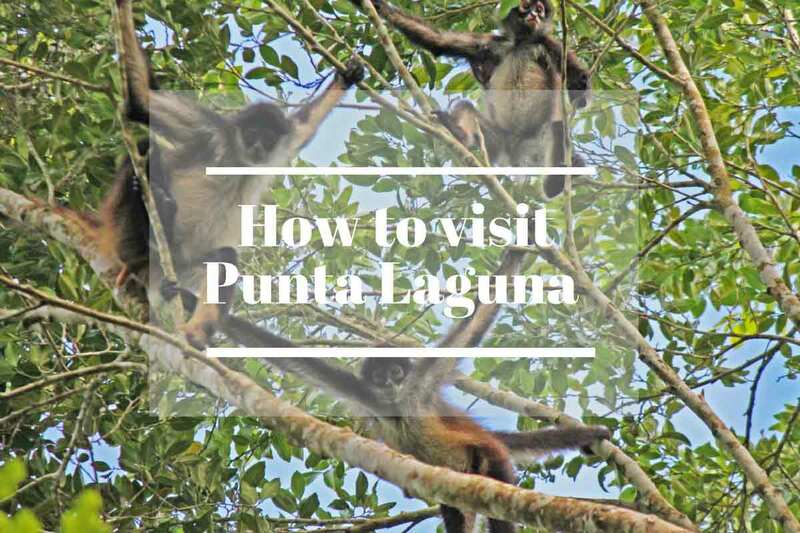 Just for the sake of information, at about 30 minutes drive from Coba, you will also find another less visited fascinating spot called Punta Laguna, where for a few dollars, knowledgeable guides will take you around the jungle to see spider monkeys, listen to the howling monkey, and maybe see some, cruise in the lagoon and, rappel down a very small cenote. You can find more information here. Opening time: the entrance is normally from 8/830 am to 5/5.30 pm – open every day. Costs: it varies from 70 pesos to 150, more if you do some extra activity. 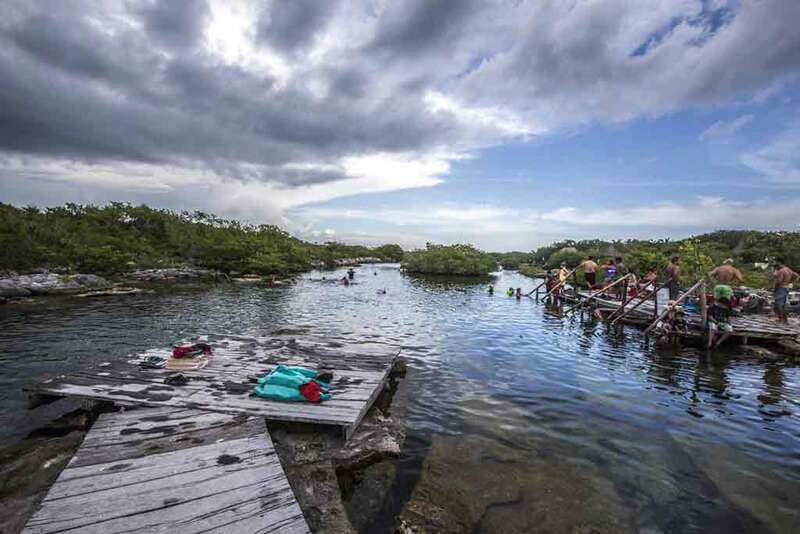 Make sure you have your swimsuit, a towel and a repellent (better if ecological), sunscreen that you should wear only after swimming in the cenote. If you want to bring your mask in some cenotes it will turn out useful. Dress light but I would recommend comfortable closed shoes to protect you from insects. They are not dangerous but certainly annoying. Hi there! I am so thrilled you are here! I am Isabella, I own an Italian passport but spent the last 16 years living in many different countries among which Seychelles, Antigua, Jamaica, and Mexico, until I finally realized that settling in one place was not for me. It took a while, I know. 🙂 So, I dropped all the heavy stuff and walked away, again, with a suitcase (or two) full of dreams, swimsuits and hiking gear. 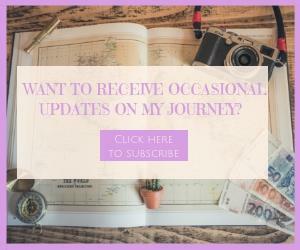 I am now exploring Mexico before heading to Central and South America, expanding my boundaries and documenting my new life in this blog.